Last year, I began working on a webinar called “Get Your Yearbook Show on the Road” to prepare yearbook advisers and their staffs to have maximum success on that first deadline in late October or early November. As I began to outline all that was needed to help an adviser and staff be fully ready to meet that first deadline, I found preparation really started well over nine months before the date for submitting that first set of pages actually arrived. 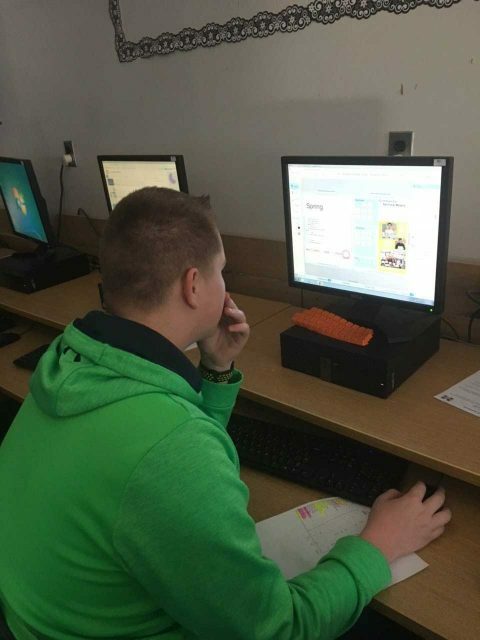 As I analyzed each step along the way, I thought it might be helpful to define each step as a specific “system” that needed to be in place to ensure that all staffers would be as prepared as possible not only to meet that first deadline, but to be successful in every step along the way as they brought their next yearbook to life. 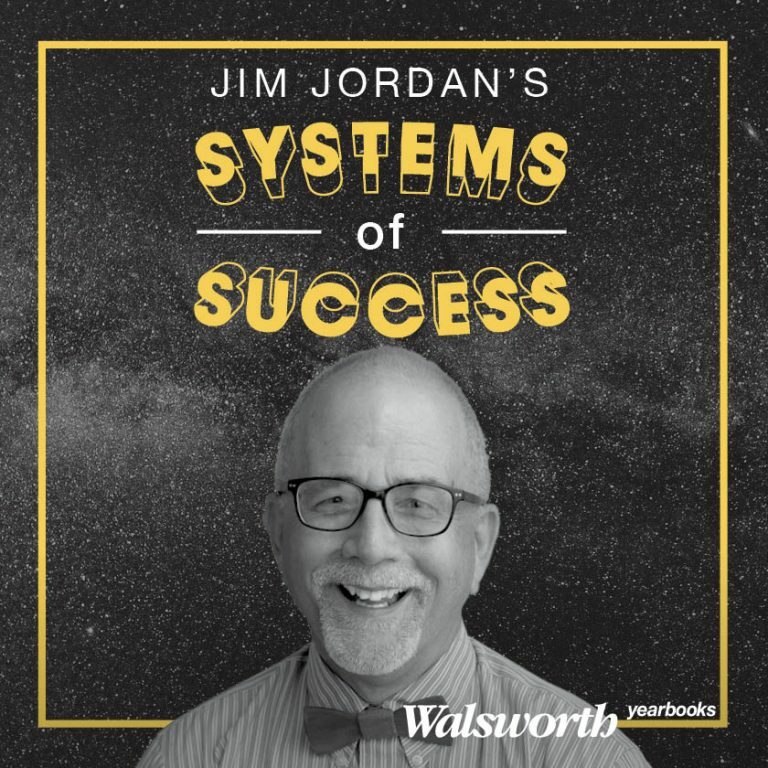 I will pick up each step in order starting in January, but to begin this Systems of Success series, I will start with where you are right now. Defining and monitoring your work flow is one of the most crucial systems to producing your book well. Without this in place, unneeded struggle and stress are almost inevitable. Define Your Work Flow System. To successfully meet a deadline on time with quality work, you must determine and communicate to the staff the specific process that each spread will go through from start to completion. Too often, we do not take the time to set up these steps and check points and hope that somehow, each individual staffer will be able to figure out what he or she needs to do to meet their individual assignment. You must consider who will be responsible for each step in the process and how will you monitor progress along the way. This just might be the MOST IMPORTANT process of all as everything you have put in place to this point comes into play here. While defining this process, be sure to set mini deadlines along the way. This allows you to check on progress in your workflow and bring to light possible challenges and difficulties finishing each spread and preparing it for final submission. How and when are your spreads assigned? Once the ladder is set up and most of the content is at least roughly defined, the work needs to be assigned to the staff. Early in the year, you could assign every spread for the entire book, but at a, minimum you must assign all work that must be completed for each deadline well before that deadline’s final due date. However you distribute the work load, you must also be sure to give your staff enough time to finish all they need to do. Rushed work is never the best work. Rushed staffers can also quickly become resentful staffers. Who is responsible for creating each part of the spread (design, interview, final story writing, secondary coverage, photos, captions)? There are many different approaches a staff can use to create each spread. This crucial decision will in many ways determine the success of your production process. Be aware what may work best for other staffs may or may not be the best choice for yours. Option #1. Each element of the spread is gathered and created by an individual staff member. He or she will design the layout (on their own or to specific criteria determined by the editors, choose or shoot and caption the photos, write the main story and create whatever secondary coverage is required. Benefits: Every staff member will have the opportunity to learn all the skills necessary to produce a page, will feel a part of the hands-on creation of the book and have the ownership of knowing what is printed is their individual work. Challenges: Some staffers may lack the interest or skill to take on every aspect of the page. Some may want to be just be a photographer, a writer or a designer and have little interest in doing it all. Another major challenge of this approach will be keeping a consistent design voice and look from the first page to the last. Option #2. Each spread is designed and created by a team of staffers. One might write the story and headline, another shoot or gather their own photos, another creates the secondary coverage and another might assemble the parts into the final design. This can work well if each team member does their own part, but can be highly frustrating if each member is not fully engaged. Benefits: This approach fosters staff collaboration and spreads the workload among a team, allowing staffers to discover and use the talents and interests they have. Challenges: If any member of the team does not play their part, it makes more work for the other team mates and can cause great stress and resentment among the staff. Option #3.The information for each spread is gathered by individual staffers, but the design and building of the page is done by a single designer or a staff design team. Benefits: This approach allows for greater consistency in the overall design of the book. Challenges: Production can be slow if the design work must flow through too few people. Staff can easily feel that they are not a significant part of creating the book. 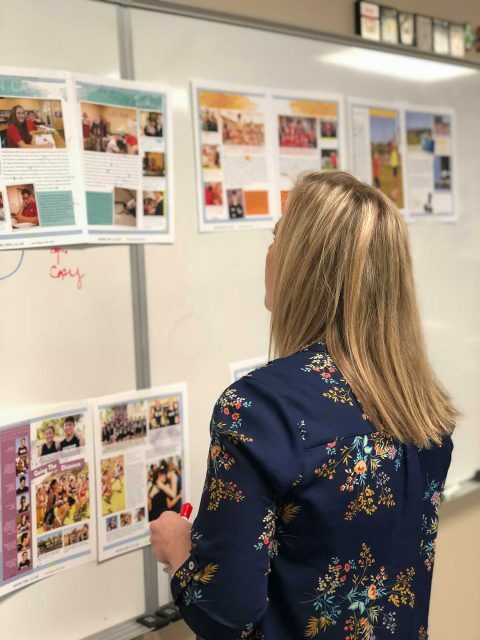 I recently heard the story of an award-winning yearbook staff that began the year with the idea that every staffer would create their own layout, but because of their wide range of design, computer and software skills, they quickly abandoned that method and had a team of skilled and fast designers construct all the pages. Once your work flow system is set up and understood by the staff, set several mini-deadlines along the way to monitor that the individual staffers and the teams are making the progress they need to be. You will need to check for understanding of the task they have been assigned and see if they are meeting the standard of quality that you and the editorial team set. Reteaching may be needed and many levels of individual coaching need to occur at these stages. Assessment scores should be connected to these checkpoints. Once the spread is completed, how will it be proofed and checked for accuracy and quality? Over the last few years I was advising, we would name a proofing editor to take charge of proofing process with not only the individual pages on a deadline, but also on the pages we received back from the plant. Spelling, grammar, usage, and AP Style. It’s amazing how often stories and spreads are never even spell checked. Create your own staff style guide that highlights the most common style concerns and questions. For example, will it be – Girls’ Varsity Soccer, Girl’s Varsity Soccer or Girls Varsity Soccer? I’ve seen them all, but whatever you choose, be consistent throughout the book. Correct spelling of every name. You school most likely can provide name lists of every student in the school. Use these lists to be sure every name is spelled to that standard. Use of a grid – Is each page set up on a horizontal and vertical grid to ensure consistency? Column width – Are the columns the widths correct based on your style standards or can they vary? Caption width – Are all captions to be a consistent width or are variations allowed? Space between photos – What standard had been set for space between photos? The standard used to be one pica, but currently is much less – 3-4 points. Secondary coverage consistency – Have the designs of your secondary mods been created and saved in a library? Width of isolation grids or rails – When you are isolating secondary coverage with white space, what is the width of that space? Space between other spread elements – How are consistent elements on the page spaced? This will vary based on the design. For example, how much is the standard space between the headline, the subhead and the body copy? The design editor(s) will dictate this, but it needs to be checked for consistency. Final Quality Check. Each spread needs to be looked at globally and the question needs to be asked: Does this spread meet the quality level we have decided for our book? This MUST be determined by the editors. It is their book, and they must decide what quality level they hope to achieve. Is it high quality? Good? Fine? Done? Never accept anything less than your very best work. As you put all these systems in place, your stress level will go down and the quality of your book will improve. What’s not to love about that?